Inside the four-month old VR/AR reality theme park The Rift in Mid Valley Megamall in Kuala Lumpur. Foong: We looked at what is growing in the market. The biggest thing everyone is talking about and where investment is going into is VR and AR. KUALA LUMPUR: The owner and operator of Aquaria KLCC in Kuala Lumpur, Aquawalk Sdn Bhd, is in the midst of expanding into Thailand ahead of an initial public offering (IPO) in 2020. The company, which is also in talks to expand into Vietnam and India, has already met investment banks for the eventual listing on Bursa Malaysia. Aquawalk subsidiary, Aquablu Technologies Sdn Bhd, which specialises in designing and building aquariums, may be included in the planned IPO. “We are exploring an IPO in 2020,” Aquawalk group managing director Datuk Simon Foong told The Edge Financial Daily in a recent interview. Although Aquawalk can seek a listing with just Aquaria KLCC — established 13 years ago and the largest oceanarium in Malaysia, Foong prefers to have more than one aquarium when it heads for a listing. A second aquarium in Phuket, Thailand will be operational by the first quarter of 2019. To be located in an upcoming mall in Phuket town, Aquaria Phuket will occupy a 60,000 sq ft to 70,000 sq ft space. Aquawalk will wholly own the aquarium in which it is investing an estimated US$13 million (RM52.03 million) to US$15 million and which, Foong said, will not just serve as a tourist destination but also as a research and breeding centre. Foong hopes the Phuket aquarium will be able to draw at least 400,000 to 500,000 visitors in the first year of operation. In Malaysia, Acquaria’s average annual visitorship is around 870,000. “We started out at 600,000 a year and we are now averaging 870,000 a year,” Foong revealed, adding that visitors reached a peak of 970,000 in 2015. Foong said the education ministry has endorsed Aquaria KLCC as an external learning facility. “We noticed Aquaria illustrations in the text books. So we suggested that we work together and do the lesson plans together,” he said, adding that Aquaria had previously been working with the ministry on an ad-hoc basis. He hopes that this partnership will expand to include secondary and higher education learning at a later stage. Aquawalk’s initial investment in Aquaria was RM65 million. Over the years, an additional RM6 million to RM7 million was invested to keep the aquarium updated and fresh. In 2014, TripAdvisor voted the Aquaria KLCC as the fourth best aquarium in Asia. In terms of performance, Aquaria turned earnings before interest, taxes, depreciation and amortisation (Ebitda) positive in the second year of operations and was profitable at net level from the third year onwards. In the financial year ended March 31, 2016, Aquawalk posted a revenue of RM36.48 million and a profit before tax (PBT) of RM12.51 million. Aquawalk then changed its financial year end to Dec 31. In the nine months to Dec 31, 2016, Aquawalk achieved a revenue of RM35 million and a PBT of RM13.9 million. And in the 12 months ended Dec 31, 2017, its revenue grew to RM42 million but PBT declined to RM10.1 million. The shareholders of Aquawalk are Vestmap (M) Sdn Bhd (52.97%), TBS Franchise Sdn Bhd (16.61%), Modal Khas Sdn Bhd (8.37%), Capping Corp Ltd (8.1%), Versatrad Agencies Sdn Bhd (4.89%), Vista Aspen Sdn Bhd (3.18%), Mace Consulting Ltd (2.68%), Sarah Francis Thomson (1.59%) and Alistair Lan Thompson (1.59%). Foong owns a majority via TBS Franchise and Vestmap. TBS Franchise is equally owned by Foong and his wife Datin Mina Cheah Kim Choo. TBS Franchise also owns 53.15% of Vestamap. The remaining 46.85% is held by Auckland-based Aquawalk Holdings Ltd which is controlled by the Thompsons. “We are also in talks with many who want to open aquariums on their own,” Foong said. With 13 years of experience, the Aquaria team is able to design, build, manage and transfer. To this end it has set up Aquablu. “We hope it will form part of the listed entity,” Foong said. It is worth noting that another company linked to Foong — Rampai Niaga Sdn Bhd which holds the Body Shop franchise in Malaysia and Vietnam — is also reportedly seeking a listing. Where next for Aquawalk? “We are looking at Vietnam,” Foong said. And after Vietnam, Aquawalk hopes to venture into India. 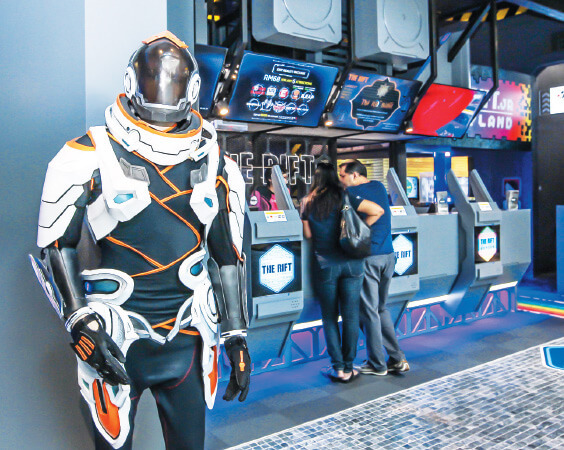 Four months ago, Foong’s Adventuria Sdn Bhd opened a new indoor theme park called The Rift in Mid Valley Megamall in Kuala Lumpur. “We looked at what is growing in the market. The biggest thing everyone is talking about and where investment is going into is Virtual Reality (VR) and Augmented Reality (AR). We wanted to start a platform to showcase what AR and VR are about and showcase them at our flagship store in Mid Valley,” he explained. Adventuria has invested RM18 million in The Rift, which offers 20 different attractions and 30 different games. Foong expects to close the year with 300,000 to 350,000 visitors and for the theme park to be Ebitda-positive by year end. Last June, Foong’s team opened the Jakarta Aquarium in Neo Soho Mall in Central Park, Indonesia. Aquawalk has a 30% stake in the venture, and provides the fish and back-of-house work. “There are two aquariums in Jakarta. It is our first year … we are hitting about 400,000 to 500,000 visitors,” he said, but added that the venture will not form part of the planned IPO.